We have 4 different cabin categories. Large winter-insulated cabins. All cabins are identical except one, and that one we call for the Taxi Cabin. See description further down. All with living room, equipped kitchen for 7 persons, 2 bedrooms, shower and toilet. TV with large channel package, including movies and sports channels and internet access. Sleeps up to 7 people if 2 persons share one of the beds. 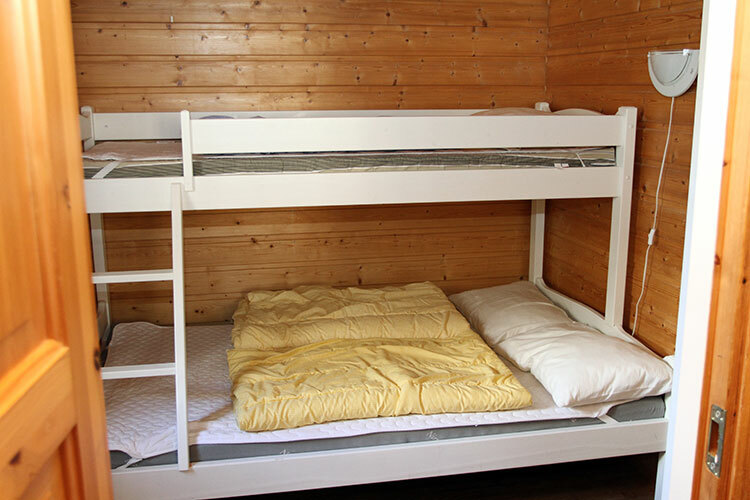 (one of the bunks has a queen size bed down, see pictures below). Cabin 1-5 all have a terrace facing the river with tables and chairs. Wheelchair friendly on the inside and outside and free parking outside the cabin. The cabins are located right by the riverbank. All cabins have pillows and blankets. Linens are not included but you can bring Your own or rent with us. Price is 95,-kr per set, 2 towels included. 4 beds. Tap water inside (no shower/ toilet). Kitchen with refrigerator and 2 hotplates. Equipped kitchen for 4 persons. Located close to sanitary facilities and playgrounds. Free parking right outside the cabin. 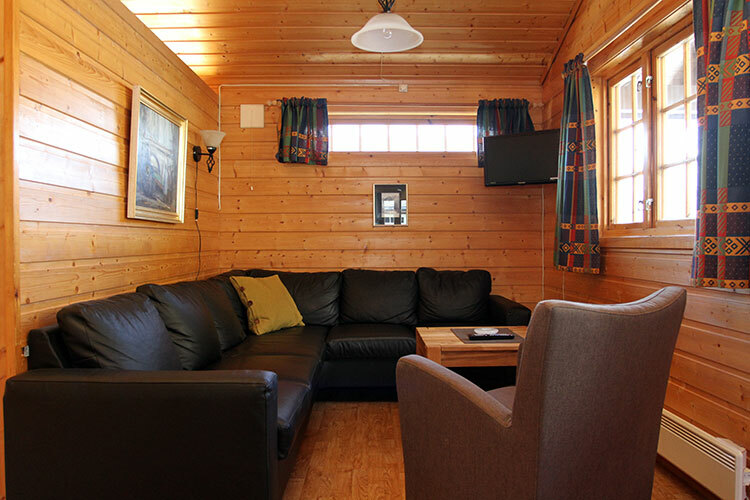 We have 2 medium cabins with 2 rooms and 4 beds. Both have equipped kitchen for 4 persons, refrigerator and 2 hotplates. No tap water inside but the cabins has a water tank of 10 liters. The cabins are close to sanitary facilities and playgrounds. Free parking is right outside the cabin. There are 3 smaller cabins where everything is in one room. 4 beds, kitchen with refrigerator and 2 hotplates. the kitchen is equipped for 4 persons. No tap water inside but with a water tank of 10 liters. The cabins are close to sanitary facilities and playgrounds. Free parking is right outside the cabin. 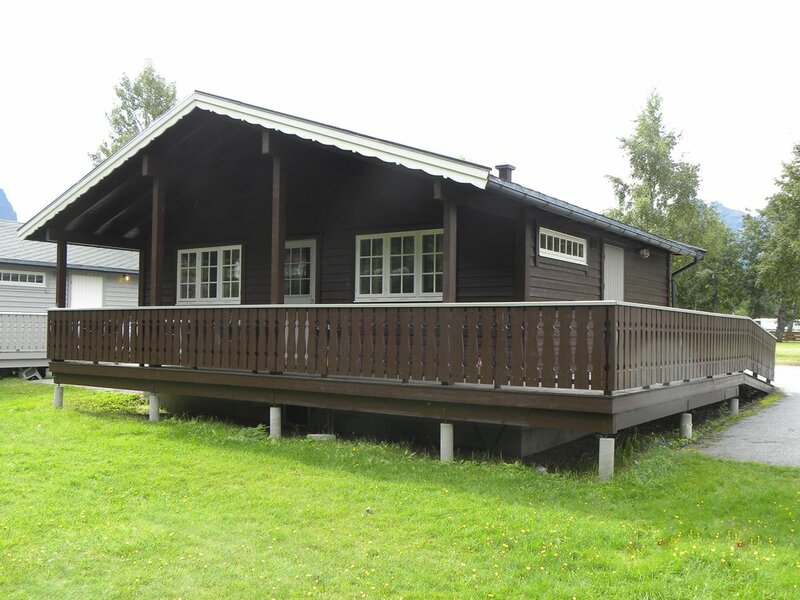 A charming cabin with 2 beds, equipped kitchen with refrigerator and 2 hotplates. Small terrace outside. Located close to sanitary facilities. Free parking right outside. In addition, we have another mini-cabin with 4 beds. Also with equipped kitchen with refigerator and 2 hotplates. Terrace outside. Close to servicebuildings and playgrounds. Free parking right outside the cabins.